This is the discussion related to the wiki page	Incident Zero - Part 3. Good tale, but what really surprises me is that Clef is still doing stuff here. It's taken over a year for me to run out of fucks to give re: whether the draft I had was worth putting up. I'm glad you did. Your writing is phenomenal. I can't wait for the rest. The whole conceit of Omega-7 in this series taking on SCP-2000 reminds me of the entire concept of Riverdale: trying to integrate characters and concepts from bygone eras into a more modern setting, but coming off silly and even more irrelevant as a result. Thank you for your opinion, but frankly, I find your feedback unhelpful. Incident Zero isn't for you. It's for the type of people who speculate that Chewbacca was a rebel spy all along, or that all of Pixar's movies fall into a giant metaplot, or who try to work out the history of Hyrule. The Doylian answer is that creative decisions change over time and tone and events and canon are malleable. Incident Zero takes a Watsonian view: issues of metaplot have in-world explanations, let's speculate on what they could be. Given your unwillingness to engage with the canon at all since it's beginning, I find your opinion irrelevant. I was sort of tempted to bring this up in Part 2, but it's since it's become kind of a big thing: that whole part with 'Yellowstone Mountain' majorly breaks suspension of disbelief. The Yellowstone Supervolcano as a concept is difficult to imagine because it's so goddamn massive,1 but 'Yellowstone Mountain' as you write is not a thing and never has been. The Yellowstone Supervolcano consists of a very large amount of magma underneath a very wide valley bordered by a lot of nonspecific mountains. There can't be a central point of the eruption, because there would be none; the entire valley would just explode and kill everything within a fifty-mile radius. It would also shoot hot ash up to twenty miles up, so if our heroes were in a helicopter like it was written, they'd be summarily fucked no matter what they did. If Yellowstone erupted, not only would most of the US Northwest be decimated, but the area above/around the park and its general vicinity would not be capable of sustaining life for much longer than .2 seconds. I know there's supposed to be some existential bullshittery going about, but I just thought I'd give you some clarification. If you've got any questions, you can definitely ask them. I go to Yellowstone pretty frequently, so I know a lot about the topic from firsthand experience. Liking Resurrection otherwise though! 1. See me for clarification: http://www.fourwinds10.net/resources/uploads/image/180563-2.jpg. Caldera outlined in red, points of thinner crust are dotted. 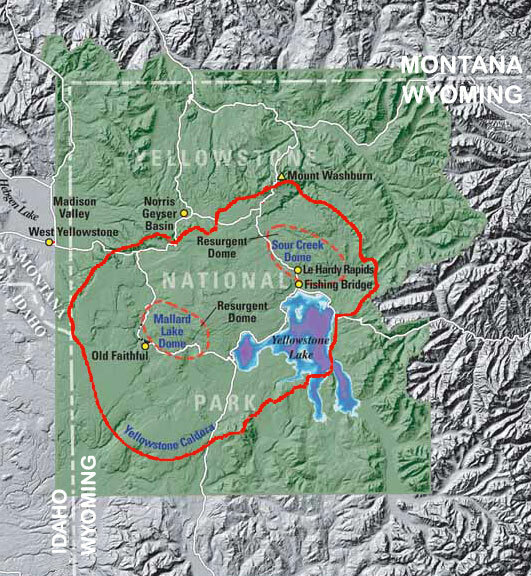 It's not entirely out of the question that Yellowstone being a supervolcano could be a massive cover just in case it ever did blow up. It'd at least be a good excuse to put up fences. I'mma disagree with you there bro. There's a shitton of geothermal activity happening there, and I have seen the results of this with my own eyes. Keeping the amount of scientists that go there on a daily basis quiet… well, it couldn't happen. Too many scientists. There aren't any fenced-off areas either, because if we were concerned about safety in regard to the potential eruption, we would have GTFO'd when volcanic activity was being discovered in the '60s. Funny thing about Yellowstone… it is a mountain. The whole thing. The mountains that surround it are actually the rim of the caldera where one big mountain used to be. If any of yellowstone's eruptions had been less energetic or had fragmented the crust in just the right way, it's entirely plausible that yellowstone might still have a central peak, or have formed a new one like the Lake Toba supervolcano's Samosir island. It's Yellowstone as a deliberate reference to major SCPs located there, by the way. This isn't a bit of worldbuilding unique to Resurrection! FWIW. Yellowstone Mountain' as you write is not a thing and never has been. Not in this reality. My take on this is that this reality destabilization ends in a reality restructuring event. In the 'base' (pre-IZ) reality, Yellowstone was a mountain. In the post-IZ reality, it's a supervolcano. Note another important difference here between the 'base' reality and the post-IZ reality: It's Cain who's a member of Ω-7, not Able, who makes his emergence at the end of the tale. Somehow I didn't immediately notice until I got to that part. And then my brain exploded. As Wikipedia says, "Owen was arrested and relieved of brigade command for reasons unknown. He was then replaced by Alexander S. Webb, who led the brigade admirably at Gettysburg. Owen later returned to his brigade after Gettysburg"
Russian Wikipedia article mentions Dennis O'Kane as the regiment's commander, but I wasn't able to find any proof of that in the English version. I fucked up. Thanks for catching it, will fix it. The ending is awesome. I can't wait for the next part when Able supposedly meets Cain and carnage ensures. One question though: does MTF Omega-7 always bring Able's stone cube with them on assignments? "Frederickson! Everyone's fine, but the back end of the car's stuck in the wall!" "I can see their front bumper sticking out of the wall behind me"
How could that be? If Car 2 is partially stuck in the wall, all they should see behind themselves should be that very wall. Looking out the side window, they'd see #3's front bumper sticking out of the wall behind them.